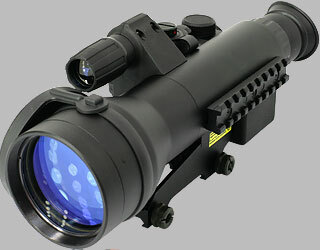 Sentinel 3x60 Night vision riflescope with 1st Gen. II Tube features 3x magnification and high light gathering capacity. The Sentinel combines traditional Yukon style (perfect design, ergonomics, reliability and convenient use) with an enhanced level of functionality. The Sentinel has a high grade of water resistance (IPX4 grade, according to the standard IEC 60529) and can be operated in precipitation of high intensity. The scope is built with a high performance Gen1 image intensifier tube. Extra tube protection provides durability towards axial load when used with the majority of popular calibers, including .300, .308 or similar. It is reasonable to use the integrated IR Illuminator for observation or shooting in low levels of night luminance. Power supply, with the voltage stabilization, works up to 70 hours using 2 AA batteries. The batteries (2xAA) are placed in the battery compartment vertically thus eliminating the influence of recoil on the stability of the energy supply. The Sentinel has two scales - a horizontal scale to measure distance to the target, and a vertical one which facilitates adjustment when shooting at different distances. It is advisable to change the color of the reticle depending on the surrounding conditions. Red is the best when used in clear viewing conditions, green is preferable for use when viewing is obscured. The Sentinel 3x60 has a wide range of mounts for weapon, including Weaver 7/8” (3 modifications), AK Side Mount, «Los» Mount, and Prism 14/200 Mount. The SENTINEL is a universal night vision scope, which is ideal for night observation and hunting. Weaver 7/8” rail The riflescope has an extra 7/8” Weaver rail placed on the left side of the body and is designed for mounting accessories (IR illuminator, directional microphone and laser pointer). Objective Lens Cap The cap is fastened on a rigid plastic ring dipped into the groove in the objective of the covering. This secures the cap from being lost. There is no need to remove the cap when viewing or shooting - you can simply slide it back and fix anywhere on the objective housing. Mount Possibilities The Sentinel can be supplied with one of the next types of mounts: Weaver mount, Weaver-Auto, Weaver-Long, AK Side Mount, "Los" mount (for Russian rifles), Prism 14/200 mount. Internal focusing of the objective. The image focusing mechanism (from 2 m. up to infinity) with fixation of the focus ring knob at the mark “100m”, provides clear image at any distances (including short) within the riflescope's working range. Remote Control Along with standard functions, the remote control has a quick start-up function. This is very convenient when constant observation is not conducted in order to find the appropriate position, take aim and shoot. Low battery indicator Double function LED indicator. Green light when the battery is full. As the battery runs down, the power indicator changes its color from green to red. This means that the riflescope will still be functioning for about half an hour before the battery is completely empty.